For Auburn, Ole Miss, Florida and Oregon State, any dreams of conference titles and playoff berths are over. But a win over their rivals -- denying Alabama, Mississippi State, Florida State or Oregon a shot at the playoff -- could still make this season a success. By the final week of November in 2007, Pittsburgh players knew they weren’t going to a bowl game. They knew they hadn’t done anything particularly memorable that season. But they also knew they had one more chance. On Dec. 1, they would travel down Interstate 79 to Morgantown, W. Va., to face a West Virginia team that would advance to the BCS Championship Game with a win. Panthers coach Dave Wannstedt kept things light in practice that week. He brought in former players to speak of the importance of the Backyard Brawl, including former Pitt teammate Dave Havern, who described how he led the Panthers from a huge deficit to beat Bobby Bowden’s Mountaineers in the 1970 meeting. Most importantly, Wannstedt explained how a team that entered the game with a 4-7 record could write its own special place in Pittsburgh football history. Pittsburgh’s 13-9 win stunned the college football world and denied the Mountaineers a chance to play for the national title. It also became one of the most important wins in Pitt’s history. Beating a rival is good enough. Crushing a rival’s dreams is sublime. Four teams have a chance to duplicate that feat on Saturday. Neither Auburn, Ole Miss, Florida nor Oregon State can make the College Football Playoff. Alabama, Mississippi State, Florida State and Oregon can if they keep winning. Each of the four games features schools whose campuses sit a short bus ride away from their rivals. Each of the games features teams that recruit from the same pool, ensuring familiarity among the players on opposing teams. Each of the games features fanbases that genuinely despise one another. What makes this year special is that each game features one team that enters with zero expectations and one that enters carrying the weight of a top-four ranking. 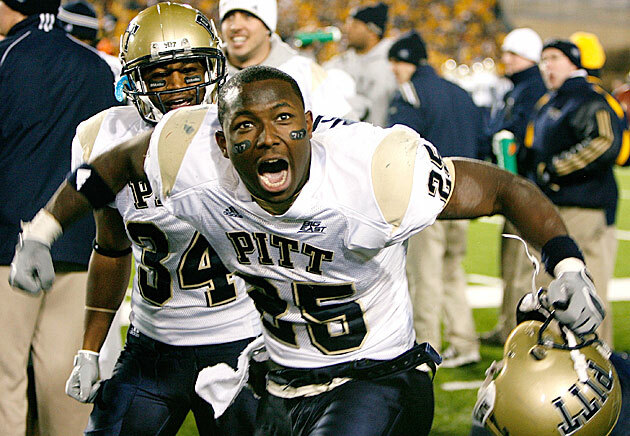 In that ’07 Backyard Brawl, Pitt had the best player (tailback LeSean McCoy), but West Virginia had the much better team. In this year’s Iron Bowl, Egg Bowl and Florida-Florida State game, the favorite has the better team, but the talent gap isn’t nearly as large. (Oregon does seem to have a similar edge against Oregon State.) Alabama must find a way to stop Auburn quarterback Nick Marshall. Mississippi State must block Ole Miss defensive lineman Robert Nkemdiche. Florida State must find a way to keep Dante Fowler Jr. out of quarterback Jameis Winston’s face. The familiarity tends to eliminate any fear the underdog may have of the favorite. At his press conference Monday, soon-to-be-former Florida coach Will Muschamp rattled off a huge list of Seminoles who were also recruited by the Gators. Google “Reuben Foster recruitment” to see how nasty things can get between the Crimson Tide and Tigers, and then replace “Reuben Foster” with “Chris Jones” to get a better view of the Ole Miss-Mississippi State rivalry. In that Backyard Brawl, Wannstedt noticed his team was awfully quiet on the bus. He had told the Panthers to be prepared for anything. “People have been tailgating since noon,” Wannstedt told the team before the ride. “We’ll be verbally abused. The rocks will be flying at the bus. The whiskey bottles will be flying at the bus.” As the Panthers rolled into Morgantown, something clanged off the bus. “Hey, coach, it’s just like you talked about in the movies,” Wannstedt remembers McCoy yelling. Everyone laughed, and the ice was broken. There would be no fear on the Pitt sideline that night. Would Wannstedt have allowed Rhoads to make those calls if Pitt had come into the game with a shot at the Big East title? “No,” Wannstedt said. “Absolutely not.” But in this case, the Panthers were playing with house money. Everyone expected them to get blown out, so risking long touchdowns wasn’t really a risk at all. Meanwhile, Auburn coach Gus Malzahn likes to dip into his bag of tricks even when his team is favored, and we know that he can throw the kitchen sink at a defense in this situation. As Auburn’s offensive coordinator in 2009, Malzahn knew the Tigers weren’t nearly as good as the eventual national champion Crimson Tide. So he emptied the playbook, and Auburn hung in until the fourth quarter against a much better team. The gap isn’t nearly as wide between the Tide and Tigers this season. • TCU at Texas: TCU quarterback Trevone Boykin is on pace to be the third quarterback since 2009 to average more than 300 passing yards and 50 rushing yards per game. The other two were Robert Griffin III and Johnny Manziel. Boykin could end up in New York like those other two did if he can keep up that pace, but his line will have to keep Texas defensive tackle Malcom Brown and defensive end Cedric Reed at bay. In their past four games, the Longhorns have allowed 213.8 passing yards a game. They’re 3-1 in that stretch. • ​LSU at Texas A&M: Raise your hand if, after LSU beat Wisconsin and Texas A&M beat South Carolina to open the season, you thought these two teams would play on Thanksgiving to decide who finishes fifth and who finishes sixth (or seventh) in the SEC West. Neither team is where it wants to be, but the winner should have a less miserable holiday season. • ​Nebraska at Iowa: Both these teams entered the season with designs on the Big Ten West title, and both will finish with their fanbases wondering whether the rampant mediocrity will ever end. The winner’s fans will experience slightly less ennui, though. • ​Western Kentucky at Marshall: The Thundering Herd had their first close call at UAB on Saturday. Now that they’ve got that out of their system, quarterback Rakeem Cato and company will face a Hilltoppers team riding a three-game win streak. Marshall players can’t control what the selection committee does with regard to the Group of Five’s one guaranteed spot in a big-money bowl, but they can control how soundly they beat middling competition. • ​Arkansas at Missouri: If the Tigers win, they claim a second consecutive SEC East title. If Markus Golden and Shane Ray terrorize Arkansas quarterback Brandon Allen the way they did Tennessee’s Josh Dobbs last week, that’s exactly what should happen. But the Razorbacks are the SEC’s hottest team after beating LSU and Ole Miss by a combined score of 47-0 in the past two games. If they aren’t satisfied with the bowl eligibility they earned last week, then they can beat the Tigers. The Georgia Bulldogs, who would win the SEC East if Arkansas beats Missouri, are hoping the Razorbacks aren’t complacent after hitting the six-win mark. • ​Stanford at UCLA: It’s simple for the Bruins. Win, and they clinch the Pac-12 South title. Given the potential for chaos described above, a win could mean an opportunity to play for even more than the conference title. Meanwhile, two teams will be rooting for UCLA to lose while playing one another. • ​Arizona State at Arizona: The Sun Devils and Wildcats play at the same time as UCLA (3:30 ET), so they may not know during their game whether they’re playing for the Pac-12 South title. Still, the Territorial Cup is a pretty big deal in and of itself. Just ask the researchers who determined this is college football’s most intense rivalry. Whether said researchers have attended an Iron Bowl is another question entirely. • ​Virginia at Virginia Tech: Each team is 5-6, so this one might be for all the Bitcoin Bowls. That probably isn’t nearly as valuable as all the Bitcoin. • ​INSIDE READ: What's next for Virginia Tech coach Frank Beamer? • ​Michigan at Ohio State: Michigan inexplicably turned in a near-upset of Ohio State last year. Could the Wolverines make it interesting again? Unfortunately, nothing they’ve done recently suggests they will. On Monday, Brady Hoke declined to offer a defense for why the current staff should remain, but Michigan defensive coordinator Greg Mattison did. He cited the team’s youth, which certainly is an issue. Now, the Wolverines will try to stop Ohio State’s offense, which doesn’t seem to have a problem with its top playmakers (quarterback J.T. Barrett and receiver Jalin Marshall) being redshirt freshmen. • ​Georgia Tech at Georgia: Instead of Clean, Old-Fashioned Hate, we could see Clean, Old-Fashioned Trying Not To Get Anybody Hurt With Conference Championship Games Next Week. The Bulldogs will learn Friday at the end of the Arkansas-Missouri game whether they’ll play for the SEC title next week. The Yellow Jackets are already slotted to face Florida State for the ACC title. The dynamics of the game could be quite odd if each team is looking ahead to trying to win a conference title the following week. • ​South Carolina at Clemson: Clemson coach Dabo Swinney said Tuesday that freshman quarterback DeShaun Watson (knee) could play Saturday even if he isn’t 100 percent. The Tigers are a different team when Watson plays, and they’ll probably need him if they want to break their five-game losing streak against the Gamecocks. For South Carolina, extending the streak to six would help salvage a disappointing season. • ​Kentucky at Louisville: Had this game been played early in the season -- as it was for the previous 20 meetings -- Kentucky might have been favored. But the Cardinals have rounded into form in the second half of Bobby Petrino’s first season back in Louisville. Now, they’re 13.5-point favorites. • ​Florida at Florida State: Can Fired Will Muschamp equal the crowning achievement of Fired Ron Zook and beat the Seminoles in Tallahassee? A group of teams just below the playoff cutline is hoping he can, but this Florida State team seems impossible to finish off. The Seminoles probably will let the Gators stay close, but no team yet has been able to withstand Florida State’s fourth-quarter surges. By that point, any emotion Florida players carried in about winning the last one for their coach will be spent. If the Gators want to pull the upset, they’ll have to beat the Seminoles straight up when Florida State is at its strongest. • ​RICKMAN: Where do Miss. State, Ole Miss sit in Power Rankings? • ​Minnesota at Wisconsin: This is the only game in the Power Five this rivalry week in which both teams can take the division title with a win. So if you’re looking for some early playoff atmosphere, tune in here. In addition to trying to win a Big Ten West title, Badgers tailback Melvin Gordon can bolster his Heisman Trophy chances with a big game against the 8-3 Golden Gophers. In his past seven games against teams ranked in the AP top 25, Gordon has averaged 172 yards per game and 9.95 yards per carry. • ​Notre Dame at USC: Two 7-4 teams that expected so much more out of this season will meet in the Coliseum on Saturday. The least checked-out group will probably win. After watching both in losses last week, it’s tough to tell which team that will be. • ​Auburn at Alabama: Auburn coach Gus Malzahn said this week that receiver Duke Williams (knee) should play for the first time since the Tigers lost to Texas A&M on Nov. 8. “I don't know if he's 100 percent, but we’re expecting him to play," Malzahn told reporters. “He’s one of our playmakers. He’s had an outstanding year, and he has the ability to make one-on-one plays and plays in traffic.” If Williams is close to full speed, he should help open up a Tigers offense that has been a shell of itself since his injury. Of course, Alabama has allowed only 5.7 yards per pass attempt this season (seventh in the nation), so if Auburn wants to pull the upset, quarterback Nick Marshall and his stable of backs will have to move the ball on the ground as well. Of course, Alabama’s defense ranks second in the nation in rushing yards allowed per attempt (2.8), so every yard will come with a price. • ​Oregon at Oregon State: After the Beavers beat Arizona State, I promised to never again discount the magic that surrounds Corvallis after night falls. This game will start at 5 p.m. local time, so much of it will be played after dark. The Ducks are still dealing with injuries along the offensive line, but the group position coach Steve Greatwood cobbled together played well against Colorado last week. It will have to do the same against a Beavers team playing to make a bowl game. • ​ELLIS: Bowl Projections: Who'll head to the playoff, all bowl games? This year’s Florida State team has worked a lot of fourth-quarter magic, but it still hasn’t posted a performance to match the 1994 Seminoles. Twenty years ago today, Steve Spurrier’s Florida team routed Florida State. For three quarters. In the fourth, Bobby Bowden’s Seminoles reeled off 28 consecutive points to force a 31-31 tie that felt like a Florida loss. The Choke at Doak still brings shudders in Gainesville, and it’s a point of pride for the thousands of Florida State fans who stayed in Doak Campbell Stadium even when it seemed their team had no hope. ESPN.com’s Jared Shanker caught up with many of the players from the game for a story this week, but for the full effect, watch the comeback/meltdown as narrated by Seminoles radio play-by-play man Gene Deckerhoff, who never met a two-yard gain he couldn’t make sound like an 87-yard touchdown. Turkey. Gravy. Sweet potato casserole. Pumpkin pie. The location? Your house. Happy Thanksgiving. Enjoy the games. • ​​BECHT: Which teams have best chance to be playoff spoilers?